VILLAGES & NEIGHBOURHOODS Connect with People Have fun with friends, go out to events, and meet local business owners in the lively neighbourhoods that give Mississauga its authentic sense of community. 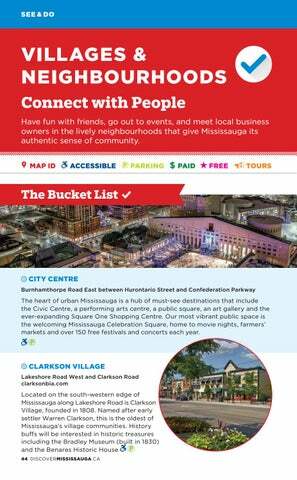 The heart of urban Mississauga is a hub of must-see destinations that include the Civic Centre, a performing arts centre, a public square, an art gallery and the ever-expanding Square One Shopping Centre. Our most vibrant public space is the welcoming Mississauga Celebration Square, home to movie nights, farmers’ markets and over 150 free festivals and concerts each year.